Raise your hand if you love exfoliation. Me, me, me (hand raised and waving)!!! For so many years I neglected to exfoliate. Well, shame on me! I was missing out. Over the past few years, I have really discovered the benefits of really good exfoliation. As a woman now in my 40s (OMG, how did I get to be 40 already? lol), good exfoliation is more important than ever. Not only does exfoliation keep my skin clear, it also has a brightening effect on my skin and it seems to be holding wrinkles at bay as well! I recently added an awesome exfoliating product to my skincare routine: Dermalogica's Daily Mircrofoliant. This product has been around for quite some time now and seems to have a bit of a cult following. I actually remember trying a small sample of it years ago and wish that I had started using it regularly back then! I have been using this Dermalogica Daily Microfoliant for a few weeks now and am completely obsessed with it! This is such a unique product. Believe me, I have a ton of products in my skincare arsenal and in my regular skincare routine...and none of these products is even remotely similar to this product. Dermalogica's Daily Microfoliant is in a category by itself: it is a powder exfoliant that you use after you wash your face. What an interesting way to exfoliate! To find out more about this amazing product, please click "read more" below! The inspiration for this product was first conceived when Dermalogica's founder, Jane Wurwand, took a trip to Japan in the 90s. She couldn't help but notice the smooth and supple hands of the women who worked with the rice crops. She later investigated the effects of rice on your skin and found that rice enzymes can do amazing things for your skin! 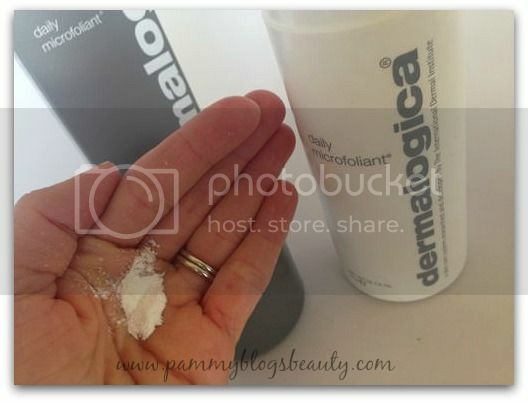 So, Dermalogica's Daily Microfoliant (a rice based powder formula) was born! Dermalogica's Daily Microfoliant is an unscented white powder in a shaker-style bottle. It is a rice-based powder that activates when it is in contact with water. The powder releases Papain, Salicylic Acid, and rice enzymes that work by micro-exfoliating you skin (removing dead skin cells) and leaving your skin feeling smoother and looking brighter! Dermalogica's Daily Mircofoliant also contains ingredients like Green Tea and Colloidal Oatmeal to soothe and calm your skin. After cleansing my skin, I very lightly dab the excess water off of my face using a clean and soft towel (tip: I use a fresh towel every night. I feel that introduces less bacteria to your skin). I keep my skin a little damp before application. Then, I wet my hands and shake a small amount of Dermalogica Daily Microfoliant into my wet hands (probably just less than a teaspoon). I rub my hands together to make the Microfoliant feel pasty (sometimes I need to add a little more water). Then I gently rub the paste onto my skin in light circular motions. I massage it on for about a minute as I want to give the actives in the product enough contact time with my skin before rinsing. Then, I rinse gently with warm water, towel dry, and finish up my evening skincare routine (serum, moisturizer, and eye cream). Wow!!! I love this stuff! Not only is my skin super soft, but also it has really cleared up! Right before testing out this product, I was going through one of those phases where my skin was breaking out (those darn hormones!). Well, the breakout cleared up much quicker than usual thanks to this product. I actually notice every morning when I am washing my face how smooth and soft my skin is from using this product the night before. I don't use this every night: more like every/other night (even though it is gentle enough to use every day). I love that this product is super effective while also being super gentle! I think that I have found a long-term favorite here that will stay in my skincare routine for years!! !